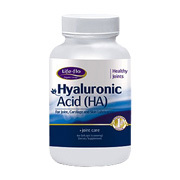 Hyaluronic Acid (HA) is a fluid that exists in every single living organism. It keeps the entire body lubricated, and moisturized, with the highest concentrations found in the skin, and synovial fluid in the joints. Hyaluronic Acid in our joints is a long, and complex molecule that forms into a ball shape, which resists compression. As we age, those molecules break down and lose their ability to keep a ball shape. This molecule is part of a group of macromolecules, known as glucosaminoglycans (GAG's), which are an important network of substances providing structural integrity to cells and joints. Scientific research suggests that Hyaluronic Acid may be able to hold more water than any other natural substance. Its unmatched hydrating properties result in increased smoothness and softening of tissue. Hyaluronic Acid (HA) was discovered in 1934. It's joint care benefits became popularized worldwide after a national ABC News report on a village in Japan. The report suggested that 10% of the population is over 85 years old and they still have substantial joint flexibility and health. It was discovered that in this Japanese village, just north of Tokyo, the residents ate a diet that was very high in sweet potatoes and vegetables, both of which contribute to the synthesis of HA in the body. High levels of HA were found in their bodies. Take one Gelcap one to two times a day, with a meal. The three key ingredients are Sodium Hyaluronate (HA) (Microbial fermentation), Vitamin C and Riboflavin (Vitamin B2). Life-flo? has added Vitamin C to the HA formula to help provide nutritive support for maximum benefits. Riboflavin (Vitamin B2) is intended to provide nutritive support for healthy red blood cell formation, cell respiration, and growth. other ingredients: Glycerine, Vegetable Cellusolve (Gelcap), Potassium Sorbate, and Water. Hyaluronic Acid - is shipped in a discrete, unmarked package. Orders are processed immediately and usually take about 3 to 5 working days to be received. We do ask that you try it for 2 to 3 weeks to feel the full effects. Any information received is used only for order processing and shipping purposes. Your information, such as e-mail address, will never be disclosed to a third party.